and the good things you have given us. . . Upon arriving at the center, the first thing we did was look for the tram tickets. We were a few minutes away from the next tram and we were in fairly full tourist season--the trams would be full. After we had gotten the tickets, we had a few minutes to wait and wandered over to one of the exhibit buildings which fronted on a small, probably artificial waterway. At the back of this station there is a small boardwalk that overlooks the waterway. In the nearby trees two anhingas rested, wings spread to dry out from the morning's fishing. At the base of another tree a great blue heron stood, unblinking, unmoving, just waiting. Waiting for what? There's a stir in the water--suddenly, splashes--not ripples of fish coming near the surface to scoop up succulent mosquito larvae or other food--full fledged splashes, as though leaping to get out of the way. Ten, eleven, twelve splashes in a progression from far away to near. And then the cause--silent and slow-moving, the black back of an alligator as it moves with hardly any stirring. It's hard to capture the excitement of seeing this kind of thing in the wild. Naturally, one goes to the gator parks and sees alligators swimming around. But this was the first time I had seen such a large animal in the wild moving. I had, a couple of summer ago, walked over a sleeping gator in Corkscrew swamp--but I had never see a living gator in the wild so close. Additionally, through the tea-colored water of the canal, you could also see the strange, elongate forms of the Florida gar, hovering out of harm's way. At first the gator swam at the surface as though enjoying the morning sun, but as he approached the ranger station, he gradually submerged and finally vanished beneath the water. That was our introduction to the wildlife of the Everglades. My description here cannot do it justice, nor do I think still pictures nor even movies. The only way to experience something like this is to go for yourself. And I would encourage everyone to take the time to do so. Go and see what is being argued about and fought over. Go and see first hand what is really present. In the course of our tram-ride we were to learn that in the ten-year history of the particular guide who accompanied us, there had been only two minor incidents with alligators and tourists--both of them the result of sheer foolishness. In neither case were the tourists seriously injured. The rule, respect the space of the gators and they will, fairly reliably, respect your space. And that makes sense--we are as alien to them as they to us--and because they have little or no reasoning ability, we are far more frightening because we tower over them--they want as little to do with us as they can. But don't come between a mother and her offspring; and for heaven's sake, don't put your child on a gator's back for a photograph. Next time, I'll try to finish this with a description of the seven mile ride into the Everglades to the observation tower--the triumph of the Army Corps of Engineers, with also was a triumph of construction for the habitat itself. And yes, what you're seeing in the male is the "whites of his eye." 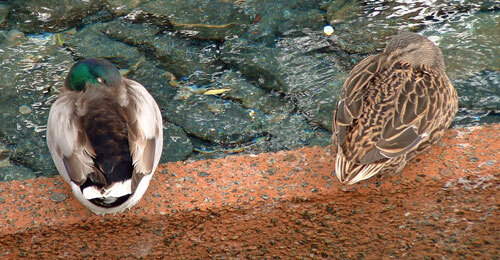 He seemed to go through a cycle of having ordinary black duck-eye and then this white look. I suppose it may have to do with predatory deterrence. Don't know, but it was interesting to watch. 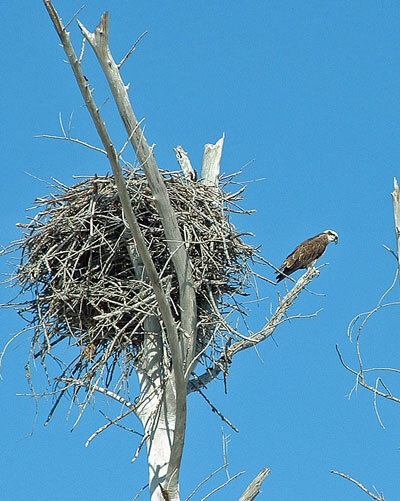 An Osprey and nest. I'm more used to the "platform" nests that seem to be common, but I'm told that when there's space, this is also a common form for the nest. Wasn't it polite of him to pose for me? But one of the mighty wonders of the Everglades. 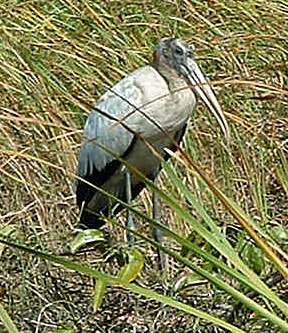 Because of this natural habitat and measures taken to preserve it, the woodstork was brought back from the verge of extinction in Florida. Looks and noise aside, that's a good thing. There's a Reason It's Called "Sawgrass"
And this photo shows you why that is pretty well. Imagine walking through this stuff for any distance? Even with heavy clothing, I'm sure the grass eventually takes its toll. Alligators and Others--The Everglades cont. 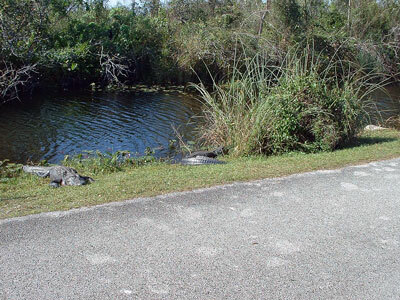 The Shark Valley Entrance to Everglades National Park has several possible ways to explore the park. You can rent a bicycle and presumably bicycle around the tram trail and other open trails--I don't know how many there might be. But for our first exposure we opted from the tram-trail to the observation tower. After purchasing tickets, we had a few minutes to spare and we spent them looking at the nearby canal and watching the alligators swim. Note, this is a park. Not a theme park--a real park. Between us and the alligators there is no barrier. The alligator in the canal could just as easily have crawled up and sunned itself in the middle of the tram-trail. How magnificent to see one of these animals in the wild. We've all seen them, probably in zoos, in attractions, or on television, but for reasons I cannot explain because I don't understand them well myself, the experience of just watching an alligator swim through the murky, tea-like water of the canal while the gar and other fish scatter before it is fascinating and strangely thrilling. You are first aware of its approach because the mullet start leaping out of the water and making little surface splashes in their panic to get away. (At least I think they were mullet.) Then you see the long black body that moves with an imperceptible motion of the tail--a slick gliding predator, cutting through the water on its way to. . . who knows where. Turns out that alligators in the wild do not eat all that often. They can go for as much as a month between big meals so while the mullet are panicking, the alligator is just enjoying a warm winter afternoon in the water. In the branches of the trees above the water where the alligator swam two blue heron and seemingly countless female anhingas. The ranger shared a story about anhinga mating practices--The male anhinga presents to the prospective mate a stick or a twig that he has collected. If the female likes the stick, the two form a mating pair and build a nest together. If she does not she is as likely as not to hit the male with the stick and chase him off. Later in the day Samuel witnessed two anhinga squawking at one another and he said matter-of-factly, "She must not have liked the stick." I never fail to be amazed by what and how much little sponges absorb. Soon enough we were aboard the tram and on the way to the observation tower seven and a half miles, or so, into the the river of grass. More later--you know, I love reliving the moment in these brief writings because I'm forced back to the day and to how wonderful it all was. We visited in perfect conditions, of course, but I'm not sure that that has all that much bearing on the matter. The scope of the Everglades is not incomprehensible. Anyone who has driven past the cornfields west of Columbus or the wheat fields of Kansas or even the stretches of lonesome prairie has a clear understanding of scope--and even, to some degree of appearance--that brown or green against the endless sky with here and there a small copse of woodland growth. This image serves to fix the understanding of the river of grass. What is difficult to comprehend is that all of this wheat field/corn field analogue is standing in a vast sheet of water, depending on the terrain, anywhere from one inch to several feet deep. And all of this water creeps and oozes a long slow way to the sea. As it does so, it picks up nutrients from the decaying mass of organic matter that lies just beneath the surface, so that as it approaches the brackish environs that border the sea, it is filled with the materials that make the Everglades system a nursery for much of the sea-life of Southern Florida--a place where the rich stocks of shrimp, fish, and other sea-life are born and grow to a certain viability before entering the ocean proper. So here you stand, at the Shark Valley station, looking out over this field of brown and seeing here and there the glint of water where the vegetation does not hide it. Because you are in the "dry season" you may not see as much water as might be visible during the wet season. Also because you are in the dry season, the evidences of animal life are much more concentrated around the sources of water. From now (January) until April, when the rains begin to return, these areas of open water will become progressively more restricted until they amount to the standing bodies in pits dug by the Army Corps of Engineers and in the "solution holes" (mini-sinkholes that perforate the limestone sponge that is Florida) that form here and there in the park. Such solution holes can be several feet deep. They are dark, hidden, and unexpected and form perfect places for alligator wallows and moccasin holes. This then was the situation I was in upon first visiting. And the impressions are indelible and hard to put into words, and perhaps not as affecting for many as for some. I have always loved the vast expanses of farmland in the midwest. There is about them an austere and somber beauty summed up in the famous line "amber waves of grain." And when the thunderheads of summer glower over them, and the winds whip up the heads of grain to give a sense of that roiling ocean, there is about these fields something that conjures up a kind of atavistic memory and delight. So it is with the Everglades. And this is made even more profound when we regard these lands with the profound respect that Native Americans have for all the "peoples" of Earth, including the rock people and the water people. When we understand, even for a moment, the patent absurdity of thinking that one can "own" a piece of land, one comes to an understanding of the Everglades on its own terms. We can destroy it--we can alter it beyond all recognition, we can build on it or tear it apart--but this land is its own. It cannot be owned, it cannot be possessed except in memory. But it can captivate. It can capture you and hold you and your mind and your heart for as long as you will give it time to reign. And in so doing, it will put you in mind of Another--One Whose hand fashioned these beauties and all the beauties of the Earth for our delight and our care. He Who made them gave us stewardship over them and they become a patrimony for all generations--a rich and beautiful treasure to be passed on intact to those who come after us as a sign of Him Who made them. There is something about the Everglades that turns the mind to God; something about them that captures the spirit and directs it upwards; something that purges, cleanses, and renews. It is as if, for a moment, one can stand in the world as God meant it to be and be in that world as we were meant to be. The concept of a valley in Florida is risible. However, as our guide pointed out, Miami is at an average elevation of about 36 inches, Naples and environs about 48 inches (above sea level) and Shark Valley is a mere 8 inches above see level. Thus, it is a true valley through which the outpouring of the waters from Okeechobee flow to the sea. Ooze to the sea may be more descriptive. The guide pointed out that water flows at a rate of about a quarter of a mile a day through the national park. Changes in the recent past have diverted the flow of much of the water away from the Everglades. There is a desultory restoration project that is seeking to restore the flow, but no evidence yet that much of anything has really happened. In addition, we in the northern climes insist on building up around Shingle Creek, the so-called "headwaters of the Everglades." In the short time I have been here what were cow pastures and wooded lands have given way to yet another pair of mega-resorts and extensions to the convention center that are, shall we say, less than needed. A city must grow or implode and die. I understand that; however, growth does not preclude reasonable planning to assure that so valuable a resource as the water that feeds the vast river of grass remains relatively pure. However, Orlando is not well known for either their vision of their future or the ability to temper their desire for yet more. I grit my teeth every time I see another thing built up along this fragile waterway. Back to the Everglades. The Shark Valley entrance to the part shows one of the main and largely unknown ecotomes of the Everglades--the "river of grass." Well, not precisely grass. More like a sedge. In fact, a particularly nasty and unpleasant sedge misnamed "saw grass." 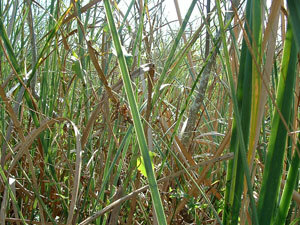 Saw grass is a sharp-bladed sedge with actual saw-teeth running the length of each ray of the compound leaf. (At least I think it's a compound leaf--my botany is really poor.) If you run your hand along it one way you will feel nothing; however, the other way will render a fairly nasty cut. Now, most people you ask seem to think of the Everglades as a huge cypress swamp, green darkness, Florida's jungle. But that is not at all the case. At least not entirely. There are hammocks and strands of this green darkness, but the Everglades proper is a glade--a wide expanse of green, or during the time I saw it brown. At first glance the Everglades look like nothing more exotic than a field of low-growing wheat with the occasional pampas grass plume. But it is upon closer inspection that the reality of the Everglades hits home. And, it was in the course of reading a book by Connie Mae Fowler that I found out the truth of it. The Everglades can sneak up on you and steal away your heart. During the brief acquaintance I made with the Everglades in the past few years, I have grown progressively more in love and more incensed at the senseless rapine and uncontrolled growth that threatens this beautiful land. The problem is that the same conservationists who argue for the life of the Everglades also spend their time agitating about the preservation of the environment of the west Houston snail-darter found in a single ditch near an outhouse next to a downtown historical monument. The excesses of the conservationists aside, the Everglades is a remarkable, indeed a unique environment and uniquely merits much of the rhetoric that has been lavished on it in its defense. The beauty of this marvelous landscape stems, in part, from the great diversity of ecotomes which dot the national park. While not part of the Everglades National Park, the strands and forests of the Big Cypress show another face of the Everglades--that bayou like deep-green darkness that one associates with much of the coastlands of Louisiana. Large stands of cypress "knee-deep" in black water are homes to ghost orchids, alligators, wading birds, turtles, black bears, and the rare (but I understand slowly recovering) Florida panther. These are not landscapes comfortable or welcoming to human visitors. In the wet season the air is so thick with mosquitoes it is difficult to breathe. The windless heat and humidity can be stifling. And yet, for those who endure these minor hardships for a glimpse of this majesty, part of the great mystery of God's creation is laid bare--not explained, not simplified, not subdued, but simply laid bare. One becomes more aware of the "two books" that God has written in the complexities of these majestic ecosystems. Imagine, for a moment, trees with a complex system of pneumatophores that make possible life in standing water. On this brief trip I was made aware of yet more of the beauty. The mangroves were not something that had entered my mind as an integral part of these anastomosing and intermeshing systems of interdependent ecosystems. And yet are the natural consequence of one simple factor--the flow of water. More later as I unravel my words. As if it were not bad enough (from the point of view of the audience) that Florida will be experiencing highs of 84 degrees or so, I'm presently suffering from vacation withdrawal. I spent much of the time after Christmas in Southern Florida exploring the beaches and Everglades. An osprey nest and perched osprey, cattle egrets, snowy egrets, great blue heron, tri-color heron, yellow-crested night heron, royal terns, pilated woodpecker, red-bellied woodpecker, wood storks, green heron, little blue heron, dolphins and alligators galore. That's just a start. In the course of the trip we visited the Everglades twice--once at each major southwestern/southcentral entrance. The Gulf Coast entrance is just south of Everglades City near or on the causeway to Chokoloskee. I've passed by it before but never given it much consideration because I couldn't figure out how one actually got to the Everglades from it. Well, the reality is that this entrance allows the visitor to engage one of the ecotomes of the Everglades--the mangrove and estuarine environment. The main activities are kayaking and canoeing along a "wilderness trail" of waterways that the uninitiated are well advised to leave alone. It is not for lack of reason that this area of Florida is called "The Ten-Thousand Islands." What we elected to do was take the boat ride out toward the gulf. On the way out we travelled through a shallow channel dredged in the limestone sponge that constitutes the state of Florida. There were channel marker signs all of which were populated by Royal Terns. These are black-headed tufted terns with bright orange-yellow bills. They sit almost always with bills pointed into the wind. Among the thousands of mangrove islands we saw what seemed like hundreds of different types of birds including Bald Eagles and any number of herons, egrets, anhingas, cormorants, and wading birds galore. The height of this trip, however, was the dolphins. We passed five or six different groups numbering from two to seven. The group of seven, persuaded by the seductive wake of the boat we were in, trailed along for several miles. The mother dolphin had a young dolphin with her that she kept steering into the relative ease of the boat wake. They jumped, played, rolled, and did any number of other things you can see at innumerable dolphin shows. In short, magnificent beyond the capacity of this hastily composed prose to convey. For now, this must be it. I hope to write a bit later about the beaches and the Shark Valley entrance to the Everglades. In the meantime, may the winter, wherever you are be a little brighter and more pleasant today. This page is a archive of entries in the Nature, Science, & Mathematics category from January 2007. Nature, Science, & Mathematics: December 2006 is the previous archive. Nature, Science, & Mathematics: July 2007 is the next archive.